a) The angle at the circumference subtended by a diameter is 90°. This is usually stated as ‘The angle in a semicircle = 90°’. The lines OA, OP and OB are equal (radii of circle). 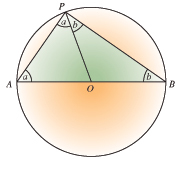 (b) The angle at the centre of a circle is twice the angle at the circumference. (c) Angles subtended by the same arc or chord are equal. In Figure 1 the angles marked x are equal and subtended by chord CD, or arc CD. In Figure 2 the angles marked x are equal, being subtended by chord BD and the angles marked y are equal, being subtended by chord AC. (a) In this diagram O is the centre of the circle. Calculate the value of angle a.